Jim D., I guess, sent my link to comic geek website Dave's Long Box. Normally I wouldn't have thought too much about it, but I guess people really read Dave's Long Box. I know this because my old roommate Kevin B. saw me and e-mailed me. For good or ill, Dave's Long Box misidentified me as Jim. I am beginning to rethink this whole "ha ha, I like Superman" thing. Hello to MySpace people. I think you might see Michael and a few other people pop by. Welcome them. 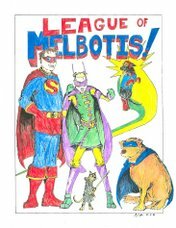 Melbotis Store update. Since Natalie thinks I should make money off the store, I jacked the prices up by a dollar or a dollar fifty or something on the items in the store. I do plan to swap out items in the near future, so if you really, really liked something on the page, order soon. We got our shirts in today, and the quality of the images is pretty good. I was pleasantly surprised. That's it for today for updates. I'm a little tired.